The verdict is in: blue kitchens and blue accents are here to stay. Whether you’re looking to add an accent of color through bar stools and a bright backsplash, or are looking for something more dramatic like all-over bold blue cabinets, there’s many ways to bring this calming color into your home. 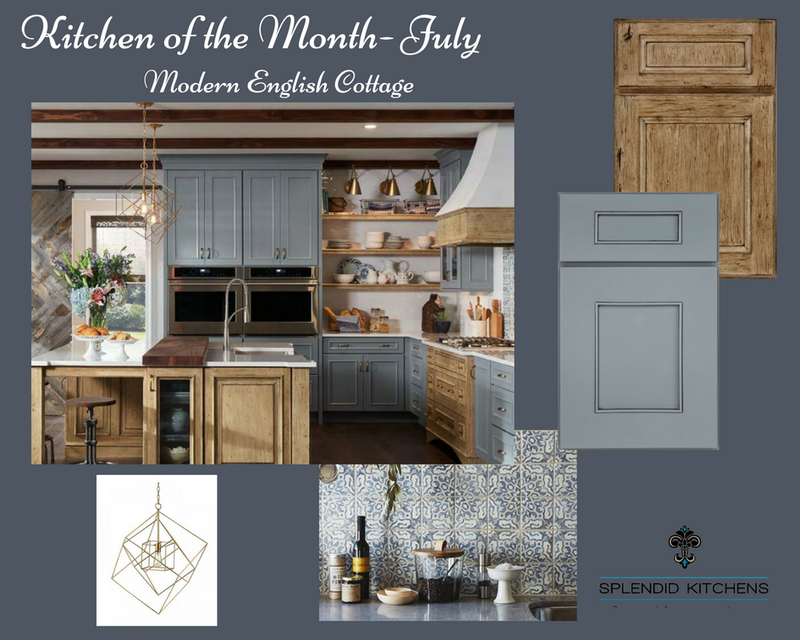 This particular chic and tranquil kitchen features mild, beautiful blues inspired by nature and classic rich wood tones that lend itself to old world furniture. If you’re looking for touches of blue- without committing to a full kitchen of blue cabinetry, mixing and matching beautiful blues with natural wood is an option. The blue cabinets featured in this kitchen are Medallion’s Dusk on Raised Panel - a wispy blue with soothing gray undertones that echo the soft hues of the evening sky. The natural wood cabinets featured here are Medallion’s Buckskin Appaloosa-- sanded, distressed, and finished by hand to evoke the authentic character and lived-in warmth of rough-hewn, weathered wood. Make sure to come check out our new line of Medallion cabinetry at Splendid Kitchens! Bronze fixtures and subtle, industrial touches contrast and bring attention to the blues hues in this kitchen, adding to the luxe, yet old-time feel of this kitchen. Moroccan and cement tiles use different colors of glaze to create patterns. These tiles are great for kitchen backsplashes, as they are long lasting, highly personalizable, and bring an element of character to the kitchen. If you would like us to help you bring this look to life in your kitchen, come visit us at the Splendid Kitchens showroom in Bodo Park, or give us a call at (970) 403-8577.